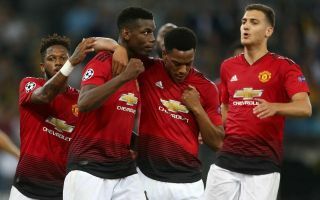 Manchester United forward Anthony Martial is reportedly expected to sign a new five-year contract at Old Trafford after talks over a new deal took ‘a promising turn’. The France international has been in fine form for United of late, earning him a recall to the French squad after the blow of missing out on the World Cup in the summer, when Les Bleus won the competition without him. Because according to the Daily Mail, it looks like the 22-year-old is now close to finally committing his future to the Red Devils with a new long-term contract after a big improvement in his form and his relationship with manager Jose Mourinho. Martial is something of a fan-favourite among MUFC supporters, so they will be delighted if this latest news does end up being accurate. Always a lethal finisher and skilful attacker, Martial has now added more work rate to his game and looks an ideal fit for what Mourinho wants from his forward players. United could do with some more contract boosts, however, with David de Gea still yet to put pen to paper on an extension to his deal that expires at the end of next season, while Juan Mata could be a free agent this summer if he doesn’t extend his stay in the coming months.